The IAF is hungry for fighter aircraft. By 2018 it was down to 31 fighter squadrons, from its peak of 39 squadrons (each squadron has 18 jets). Over the next decade, it would retire 14 squadrons of MiG-21s, MiG-27s and MiG-29s, numbering over 200 aircraft. The IAF planned to replace all these retiring aircraft to reach its sanctioned strength of 42 fighter squadrons by 2027. On 04 January 2019, replying to the opposition charge of irregularities in the fighter jet purchase from France, the Indian Defence Minister has justified it while informing Parliament that the fighter jet strength of the country had fallen substantially during the last decade in contrast to China & Pakistan, who had been adding air power. "China added over 400 fighter jet between 2004-15. Pakistan doubled their number of F-16s and added 43 JF-17 planes to its air force. India had 33 squadrons in 2015, down from 40 in 2004," Nirmala Sitharaman, Minister of Defence said while replying during the debate on controversial Rafale deal. By the end of 2016, the Indian Air Force had 34 fighter squadrons (18-20 aircraft per squadron) but required 42 active squadrons. 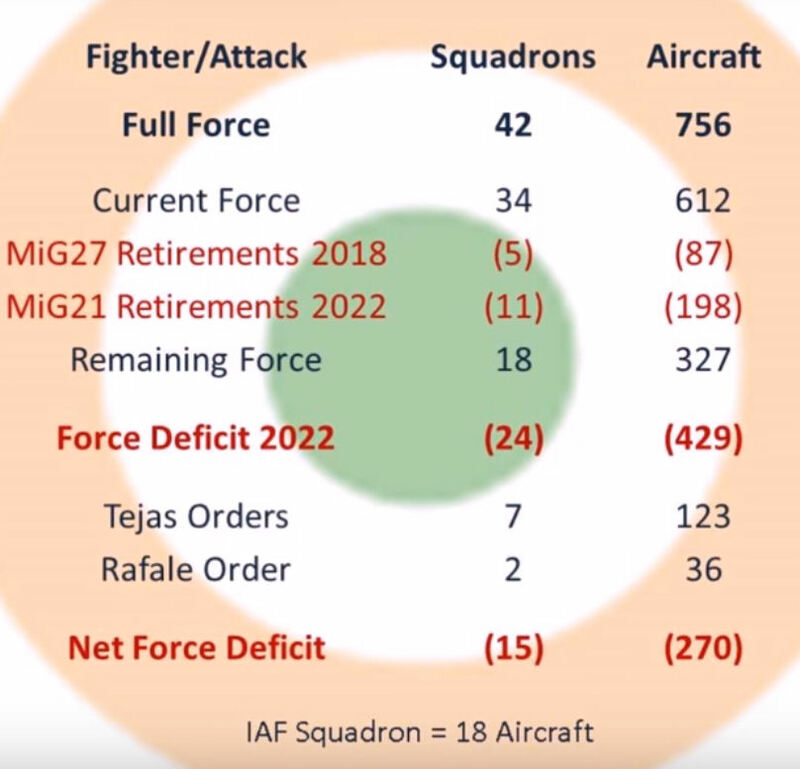 India has to wait more than a decade to achieve the required strength of 42 squadrons to fight a simultaneous two-front war. The Indian Air Force plans to replace the venerable MiG-21 series of combat jets with the home-produced fighter named Tejas. But, capacity constraints at the factory means the replacements will take place at a very slow pace. Indian Air Force (IAF) boss, Air Chief Marshal Arup Raha, stated in October 2015 that the air force was ordering 120 (six squadrons) Tejas Mark I Light Combat Aircraft (LCA), triple the 40 aircraft it had previously committed to buying. Raha predicted, "We are looking forward to building up our combat fleet to 42 squadrons by the end of the 14th plan, by 2027. I think it is possible, it is viable, there are a lot of options available with us, and discussions are already on." Outgoing IAF Chief Arup Raha indicated 28 December 2016 that the service required more aircraft in the middle weight category to give the entire spectrum of capability. Adding that India has enough Russian-origin Sukhoi-30 MKI heavyweight combat aircraft, Raha said, "We are still inducting Sukhoi-30s; it will last us for another 40 years. The Light Combat Aircraft (Tejas) will fill some void in the lightweight category." Raha indicated the need for 200-250 medium weight combat aircraft in next five to 10 years but would like them to be manufactured in India. India’s Defense Research and Development Organisation, the designers of Tejas, expected the current order of 83 combat jets to completed only after a decade or more. The first aircraft itself may take another two years if everything goes according to schedule. Currently about 250 MiG-21 series fighters are waiting to be replaced. The high level Defense Acquisition Committee on 07 November 2016 cleared the procurement of 83 light combat aircraft (LCA) put together by the state-owned Hindustan Aeronautics Limited (HAL). A fighter squadron nominally consists of 20 fighter aircraft, though in practice at times as few as 16 aircraft may make up a squadron. As of 2000, the Indian Air Force was equipped with twenty-two squadrons of ground attack fighters. Five of these squadrons have over eighty British Jaguar aircraft. Another five squadrons had over 130 Soviet-origin MiG-27 aircraft. The air force also fields twenty fighter squadrons, two of which are equipped with a about 40 French-built Mirage 2000 H/TH aircraft. The Indian Air Force has also recently acquired a small but growing number of Russian Su-30 multi-role combat aircraft. There were also twelve squadrons of transport aircraft in the inventory. Because of the large number of Soviet-origin aircraft, the air force is dependent on Russia for spare parts and equipment and weapons upgrades. As of early 2002 the IAF reportedly planned to have around 35 combat squadrons by 2010, versus the existing 40, each equipped with the modern aircraft after around 300-350 MiG-21 variants are phased out. This revised plan apparently reflected the availability of imported aircraft, such as the Mirage 2000. As of 2005, the Indian Air Force claimed to have 32-33 squadrons of fighter aircraft and sought to expand that to 40 squadrons. However, there were about 41 fighter squadrons active in the IAF, spread out among the five geographical commands. This discrepancy might arise from some squadrons not being officially disbanded despite their aircraft undergoing maintenance or being phased out. The IAF might be awaiting to resupply some of these squadrons from the 140 SU-30's being manufactured by HAL and the additional 126 multi-role fighter aircraft the IAF is expected to order in the near future. From a peak of 39.5 squadrons in the mid-1980s, by early 2006 the IAF was down to 32 squadrons or less, seven below its sanctioned strength of 39.5 fighter squadrons and the lowest in over three decades. At that time, sixteen squadrons of the MiG-21 formed over 40 per cent of the fighter fleet, accounting for over half of all fighter aircraft sorties flown each year. The oldest MiG-21s - nearly 100 Type 77 aircraft - acquired in the early 1970s had reached the end of their 3,000-hour service life and were retired in 2007, causing the single largest void in the air force. At least 500 other aircraft were to be phased out by 2015, including over 100 MiG-27 strike fighters, causing a gap in the IAF's ground attack capabilities. The last two MiG-23 squadrons, purchased in the 1970s, were retired in 2006, a year before their planned retirement as part of an accelerated phase-out of old aircraft with unreliable engines. A squadron of MiG-25 strategic recce aircraft was de-inducted on 01 May 2006. Replying to a query whether with the phasing-out of the Mig-25 the IAF reconnaissance needs were affected, Air Chief Marshal Fali H Major said 13 February 2009 that the role of ISR (Intelligence, Surveillance and Reconnaissance) was a part and parcel of any Air Force and that the IAF has it. He also stated that there are better and efficient ways of getting ISR. As of 2007 the Indian Air Force (IAF) had around 30-32 squadrons worth of serviceable combat aircraft. This was well below the target of 39 1/2. About 21 squadrons flew MiG-21s of one vintage or another, and overall squadron strength was projected to plunge to 27 during the 2012-2017 period. At the beginning of the 11th Plan period [2007-12], the force had only 32 squadrons. 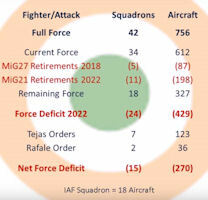 In February 2009 Defence Minister A K Antony said that by the end of the 13th Plan period, Indian Air Force's combat fleet would be of 42 squadrons, more than the strength sanctioned by the Government. "During the period 2007-2022, the strength at the end of 11th, 12th and 13th Plan periods is expected to increase to 35.5, 35 and 42 squadrons respectively," Antony said in a written reply to a query in Rajya Sabha. Government had sanctioned the IAF to have a total of 39.5 squadrons of fighter aircraft. He said that the air force will reach the peak of strength with the induction of Su-30 MKIs, Jaguars, Medium Multi-role Combat Aircraft (M-MRCA), Fifth Generation Fighter Aircraft (FGFA) and the Light Combat Aircraft (LCA). Chief of Air Staff Air Chief Marshal F.H. Major said in July 2007 that the air force wanted to reduce the inventory in its combat jet arsenal to three aircraft systems only, and over the next few years, it would use the home-made Tejas as the Light Combat Aircraft (LCA), the new MRCAs as the Medium Combat Aircraft (MCA) and the 35-ton SU-30MKIs as the Heavy Combat Aircraft (HCA). Chief of Air Staff Air Chief Marshal F H Major said in February 2009 that "Our plan is to use Su-30 MKIs, MRCAs, Tejas, upgraded Mirage-2000 and Mig-29 as well as Jaguar aircraft." Air Chief Marshal Fali H Major said 13 February 2009 that the squadron strength envisaged by 2017 was 34 squadrons and the remaining strength was to be achieved by 2020. Contracts were signed 19 December 2011 with M/s Thales, France, along with M/s Hindustan Aeronautics Limited (HAL) for the upgrade of the Mirage 2000 aircraft of the Indian Air Force, with M/s HAL for upgrade of the Jaguar aircraft and with M/s RAC-MiG Russia for upgrade of the MiG-29 aircraft. The cost of the contract for upgrade of the Mirage 2000 with the M/s Thales, France is Euro 1470 million while the cost of the contract with HAL is 2020 crores. The upgrade of the aircraft is expected to be completed by mid 2021. The cost of upgrade of the MiG-29 aircraft is USD 964 million and it is expected to be completed by 2016. The cost for upgrade of the Jaguar aircraft is Rs.3113.02 crores and the aircraft are expected to be upgraded by December 2017. A multibillion dollar deal for the procurement of 126 Dassault Rafale fighter jets was initially agreed to in January 2012. Continued negotiations have since then held up a fiinal contract agreement. The question of production-licensing to India's Hindustan Aeronautics Limited (HAL) was said to have been a sticking points thouth reports have surfaced saying that HAL would ultimately be responsible for 70 per cent of the work on the 108 planes that are to be manufactured in India, while the first 18 fighter aircraft are to be fully manufactured in France. India was reported in some media sources to have warned in September 2012 that it would cancel the Rafale contract fighter jets if Paris refused to fulfil its obligations under the Mistral contract agreed to with Russia. A Parliamentary panel on 22 December 2014 revealed that the force levels of the Indian Air Force were down to 25 fighter squadrons. The IAF until recently had maintained it had 32-34 squadrons with about 18 planes each. But the revelation by the standing committee on defence in a report tabled in Parliament indicated the IAF's traditional air superiority over Pakistan may have been severely diluted. India requires 45 fighter squadrons to counter a “two-front collusive threat,” but the panel found that the air force had only 25 active fighter units. "Moreover, 14 of these squadrons are equipped with MiG-21 and MiG – 27 which will retire between 2015-2024. Thus the strength will be reduced to just 11 squadrons by 2024.. our capability has already come down,” the panel said. It flagged concerns about India’s depleting military capability in the context of tackling a two-front challenge – euphemism for a combined threat from China and Pakistan. A total of 54 MiG 21s and MiG 27s, bought from Russia in the 60s and 70s - would be de-commissioned by the end of 2015, bringing down the strength of the Air Force from 35 to 32 squadrons, by one account. The Air Force - which needed at least 42 squadrons of 18 aircraft each to provide proper air cover at the Western and Northern borders - considered an unprecedented step to fill the gap. The IAF told the government that it could divert four to six planes from the existing squadrons - depending on requirement - to keep the total number of squadrons intact. The 18 fighters of a squadron include two trainers and two fighters in reserve. On 29 June 2016 it was announced that Rafael will supply 164 examples of its Litening targeting pod to the Indian air force, for use on four types of combat aircraft including New Delhi’s Sukhoi Su-30 fighters. The pods will be delivered over severl years. The Litening 4I advanced version of the Litening will be supplied. The improved system was been equipped with upgraded infrared cameras and a charge-coupled device color camera to help identify targets on the ground, particularly dense areas. The new version double as a surveillance and reconnaissance system in addition to being a targeting pod. In February it was announced that the Litening acquisition waspart of a larger $500 million deal between India and Israel, with the Rafael Spice 250 precision-guided bombs also provided to New Delhi.